MCA members enjoy exclusive discounts on lodging, travel, car rentals and much more. We have an extensive network of discount partners giving you thousands of choices and options for everyday services you use. Why pay more? Along with travel planning and discounts, receive help if you're on the road and you have a medical emergency. We'll help make sure that children travelling with you are placed in the care of your loved ones, and that you receive the medical care to which you are accustomed. Our Discount Partners allow you to cultivate savings while tending your passions. A membership with MCA can save you hundreds of dollars each year on items you were already going to buy. 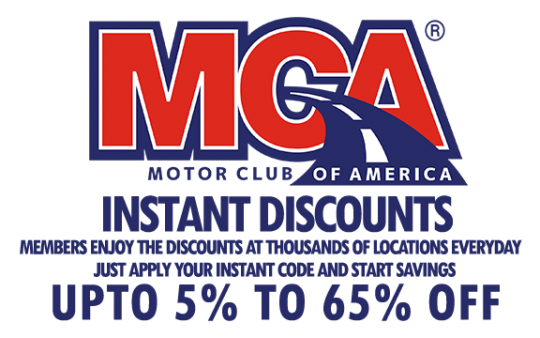 Become a MCA member with us and save! Discover Motor Club of America that provide the service you deserve, and the peace of mind you most desperately want when the unexpected occurs at home, on the road or at the job. Disclaimer: The FREE WellCard Health program empowers you to reduce the cost of health care with each use of pharmacies, vision care providers, hearing specialists, prepaid lab test, prepaid imaging test, patient advocacy services and more. And if for some reason in the future you no longer retain your membership with TVC or MCA, you can keep the WellCard as our gift to you. For complete information on the WellCard Health program you can go to www.WellCardHeath.com and click on Get Started and enter the Group ID TVCM. You can also download the WellCard Health app on your smart phone and use the same Group ID TVCM. And remember this is Free to you. Please Understand that this is Not Insurance. It is a discount medical program. It does not replace COBRA or any other medical insurance program nor is it a Medicare Part D prescription drug plan. WellCard Health does not qualify for essential coverage under the affordable Care Act (ACA-ObamaCare). Cardholders are responsible for paying the discounted cost at the time of services from participating providers. WellCard Health has no membership fee nor is participation in any organization or purchase of any good or service required to obtain or use WellCard Health. WellCard Health will not share or sell your personal information. This discount plan organization is Access One Consumer health, Inc., (not affiliated with AccessOne Medcard), 84 Villa Road, Greenville, SC, 29615, www.accessonedmpo.com. This program is not available to residents of Montana, but may be used by non-residents at participating Montana providers. Other state residents please visit www.WellCardHealth.com for full disclosure statement. Not available in Canada. The DMPO does make available a list of all program providers which include their name, city and state and medical specialty prior to purchase, upon request. Save on Health and Wellness costs with WellCardRx! If for some reason in the future you no longer retain your membership with TVC or MCA, you can keep the WellCard as our gift to you. For complete information on the WellCardRx program you can go to www.WellCardRx.com and click on Get Started and enter the Group ID TVCM. You can also download the WellCardRx app on your smart phone and use the same Group ID TVCM. Disclaimer: The FREE WellCardRx program empowers you to reduce the cost of health care with each use of pharmacies, vision care providers, hearing specialists, prepaid lab test, prepaid imaging test, patient advocacy services and more. And if for some reason in the future you no longer retain your membership with TVC or MCA, you can keep the WellCard as our gift to you. Cardholders are responsible for paying the discounted cost at the time of services from participating providers. WellCard Health has no membership fee nor is participation in any organization or purchase of any good or service required to obtain or use WellCardRx. WellCardRx will not share or sell your personal information. Discover Motor Club of America that provide the service you deserve, and the peace of mind you most desperately want when the unexpected occurs at home, on the road or at the job. Your coverage is not only limited to roadside assistance, but you also have the added assurance of personal accidental coverage, emergency room benefits, discounts on prescription drugs, dental care and vision care. Help is literally a phone call away. With membership plans from Motor Club of America, we provide the protection you deserve when the unexpected occurs at home and on the road. With over 86 years of experience, MCA knows how to provide the best in customer care while offering a variety of options that best suits your individual needs. We offer different coverage levels to suit your individual needs. Your first and last month of the service agreement is paid at the time of checkout. Once payment is received, your Total Security Plan is active 24 hours later. Membership & Discount Card will arrive to your home within 7 to 10 business days. You can easily cancel your coverage at anytime without any penalties. Simply call our toll-free roadside assistance number and describe your situation, including the vehicle’s problem, so we can send appropriate help to assist you immediately.